The North County Trailway (and South County Trailway) are part of a rail-to-trails project that is supposed to eventually connect Van Cortlandt Park in the Bronx to the Putnam County Trailway. Its name is a little deceiving as the "trail" is actually a car-free bike path. 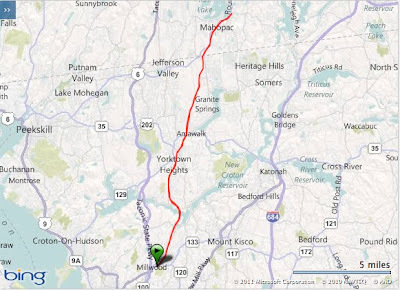 The North County trailway is about 22.1 miles, running from the Putnam County border down to the Eastview section of southern Greenburgh where it meets the South County Trailway. The South County Trailway then extends 14.1 miles to Van Cortlandt Park. The Putnam Railroad once followed much of this trail system, providing freight and passenger service between the Bronx and Putnam County from 1881 to 1958, and serving 23 stations in Westchester County. Former stations can still be found along the way in Briarcliff Manor, Millwood and Railroad Park in Yorktown Heights. 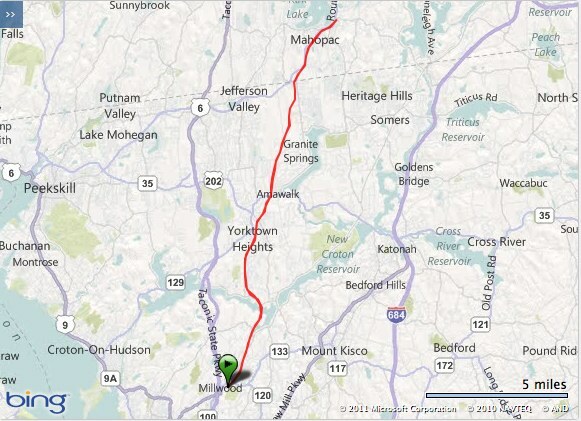 On Saturday I joined Eric for a 30-miler on the South County Trailway (a 15-mile out and back from Millwood to Lake Mahopac). On the return trip we met up with Cherie and had an absolute blast. Today saw a shorter 13 or so mile run back at Rockefeller State Park Preserve. Overall it was a good week of training, a perfect last week leading in to the taper for Umstead.